Based in Marly-le-Roi from 1874 to 1877, Sisley executed a group of seven paintings on the flooding of the Seine in March 1876. The best known of the series depict the flood at its height, albeit expressed with a serenity and harmony more characteristic of a tranquil lagoon than the violent waters of the Seine. In this work from the Carmen Thyssen-Bornemisza Collection, the sun has reappeared and the water level is going down. 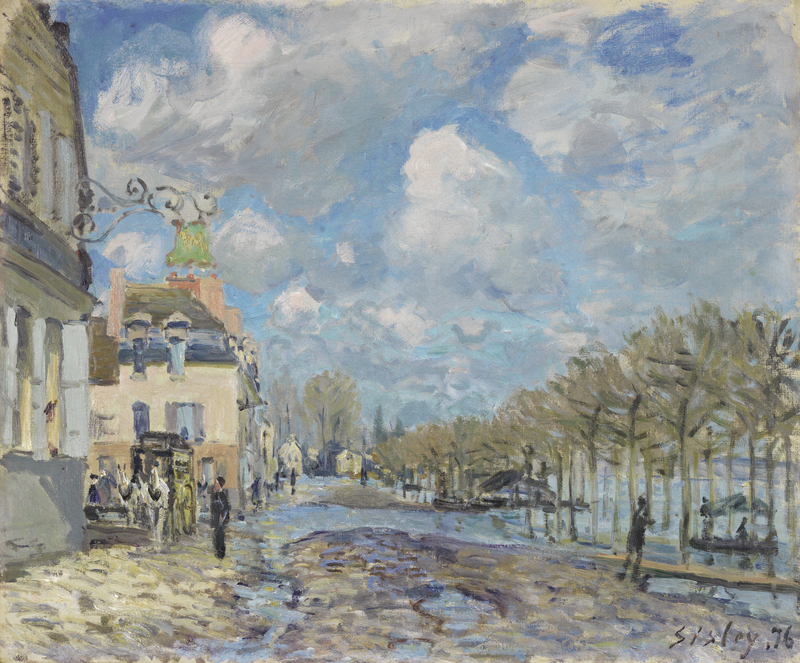 Sisley was thus able to set up his easel in the middle of the street and return to the use of a central perspective found in many of his works, a device that derives from the classical tradition of French landscape painting. Sisley was able to give a marked emphasis to the movement of the clouds through the use of a low horizon line. As in the work of Constable, the sky becomes the true subject of the landscape and its reflection on the ground both unifies the composition and increases a sense of dynamic life. This painting shows the rue de Paris in Port-Marly. To the right, behind a double row of trees, we can see the Seine. Under a changing sky, full of clouds torn by the wind, the rising water is beginning to flood the pavement and the road. In December 1872 Sisley had painted four pictures showing floods at Port-Marly. In 1876 there was another flood and Sisley executed seven paintings as documentary evidence of its different stages, from the first rise in water level to the return of the river to its normal course. In some of the paintings of 1872, as well as in those of 1876, the artist chose a frontal view, avoiding perspective effects, while at the same time organising the composition according to a strict geometry, as Georges Seurat would do to a certain extent in the following decade. Yet the work we are analysing seems to have been organised in line with traditional perspective. Nevertheless, instead of giving an impression of stability, as might have been expected from this return to tradition, this composition is unsteady, as if the vanishing point were somehow a vortex around which the whole scene whirled. This effect is partly due to the atypical use that Sisley makes of the principles of perspective. Let us observe, for example, the facades of the houses on the left, in the foreground. Their inclusion in the scene depicted seems incompatible with the point of view that the onlooker would assume for the rest of the picture. This instability effect is accentuated by the striking spontaneity of the brushstrokes as well as by a particular sensitivity with regard to colour, which enables the artist to use a combination of shades of blue and black that very few Impressionist painters would have dared to include in their compositions. In September 1876, shortly after Sisley had concluded his series on the floods at Port-Marly, Stéphane Mallarmé published an article on the Impressionist artists in the London magazine The Art Monthly Review. Regarding Sisley, Mallarmé wrote: "He captures the fleeting effects of light. He observes a passing cloud and seems to depict it in its flight. The crisp air goes through the canvas and the foliage stirs and shivers". If we forget for one moment that the vegetation represented in this picture is made up of still tree branches devoid of leaves in February, those lines might well be read as a precise evocation of the painting we are contemplating.